Following the recent podcast [LINK] and extensive discussion about the merits of Andros Townsend’s long-range shooting, I thought it would be timely to update the Shot Benchmarks that I’ve previously shared on twitter in 2012 to include the 2012/13 season. This post can serve as a useful reference for the analytics community. Of those 55,000, nearly 500 are penalties that continue to be scored at a rate of 3 in 4 (75.6% to be precise). 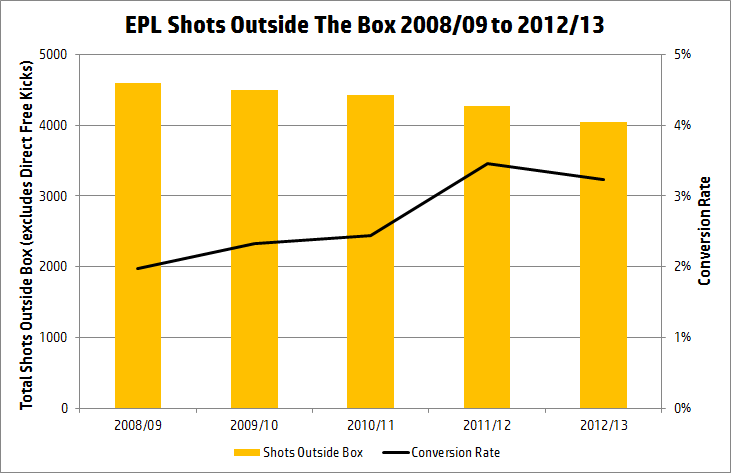 The conversion of shots outside the box has also improved over time (even if 2012/13 slightly less than 2011/12). In 2008/09 the figure was 1 in 50 open play shots outside the box scored a goal! Over the last 2 seasons this has improved to 1 in 30. Over 5 seasons the average is 1 in 37, a huge difference to the 1 in 15 scored from direct free kicks. As a consequence of the decline in total shots outside the box, the proportion of shots INSIDE the box increased year on year from 55.6% to 59.1%. Trying to sum it all up with a nice soundbite, the last time I looked at this analysis at the start of 2011/12, the mantra was that 45% of all shots are from outside the box for just 15% of the goals. If we exclude DFK’s and penalties and look over 5 years, this changes to a less snappy 42% of shots are outside the box for 14% of the goals. But it still begs the question, if the chances of scoring from outside the box are so low why do teams even try to do it? Wouldn’t it simply be better to keep passing and probing until a chance inside the box could be created or a set piece opportunity won?